Alzheimer's Medical Bracelets come highly recommended by Doctors and Paramedics. 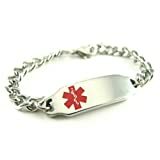 This medical bracelet comes with BLACK pre-engraved, medical information, that is easy to see and read. Black engraving is highly recommended to increase visibility. Medical ID Card is included with all items. Buy professional Medical Jewelry & Engraving for your safety.